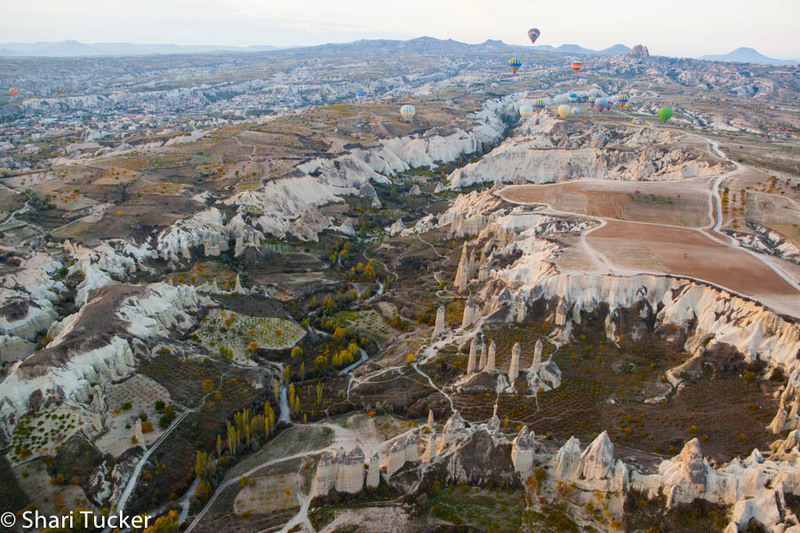 The above photo was taken on an amazing hot air balloon experience in Cappadocia, Turkey, thanks to Experta and The Gallipoli Artist. It captures perfectly what my heart was feeling … The appreciation of wide open spaces, the beauty of autumn in Love Valley and yet a few other balloons off in the distance to remind me that I was not alone. Your camera is an object. It is devoid of feelings. It only works when connected to a human hand, which is connected to a human brain and human heart. It is not the camera that takes amazing photos, it is the person behind the camera. It is the person behind the camera whose eyes you are seeing through. It is not just the emotions of the subject that you see, you are feeling the emotions of the photographer and how they saw the subject. You are connected to the photographer’s heart. When you are traveling the world, it is exciting to capture everything with your camera. It’s wonderful to be able to share what you see with your friends, family and social media followers. Everyone loves photos and stories of far away places. When you travel though, I urge you to go first with your heart and second with your camera. When I travel, I go first with my heart. I travel for the love of other cultures and for the open mindedness it has instilled in me. I travel to understand other people, their struggles, their way of life and their joys. I travel with my heart because no matter where I go, I still care about people, about humans. I don’t travel to take amazing photographs, those are simply the byproduct of what my heart feels and my eyes see while I am there. I travel to have experiences that change my life, and hopefully change others’ lives for the better. There are days when I am on the road that I leave my camera behind. It is so easy to get caught up in taking photos of all of the new and amazing things that you see everywhere in a new city or country. It is normal for a photographer to want to document them because that is what we do. But, sometimes I make a decided effort to leave my camera behind so that I am fully present in the moment and spend time learning, feeling and seeing the country, the people and the history without trying to ‘capture’ it. If you are in a country for seven days and you spend all of your time wrapped up in taking photos so that you can ‘remember’ it, what is it that you are remembering? Simply the photos that you took. Instead, what if you took time to enjoy the country you are visiting and let the photos help remind you of the amazing people you met and things you did instead of missing out on the real country just to capture the outer layer. If you just can’t bear to leave your camera behind, here are a few tips on how to travel with your heart, not just your camera, but still have your camera in hand. 1. If you are photographing people in another country, remember that YOU are the invader of their privacy. It is not your right to take their photo. If you approach people with your heart, with a true interest in them, they will be more relaxed and more willing to let you photograph them. If you stick a camera in their face without even saying hello, you are invading their space and intimidating them. 2. Get to know the people who you are photographing so that you don’t just have photos of random people, you have stories and experiences to share. 3. If you are traveling with a tour guide, I know this is hard, but try listening to what the guide has to say about his / her country and the location you are at rather than snapping away. Once you hear the history and stories behind the location you will look deeper for photos with meaning rather than snap shots of ‘interesting things’. You will photograph from the heart because you will understand the history, the struggles, the achievements of the place you are standing in. Listen and learn, then photograph to tell a story, not just to have photos. 4. Take days (or hours) off from photography. Choose to do something of interest and enjoy it fully without your camera. Maybe this is going for dinner in the evenings. Do you really NEED a picture of every meal? Will you do anything with the photo of that restaurant? Do you know how to properly take night photos so they are not blurry? Don’t take your camera with you because you feel you have to. Leave it behind you so can be present. It will give your brain (and neck) a break and you’ll be more refreshed for shooting the next day. Your camera is an extension of your heart. You have the power to capture both your emotions and the emotions of your subject in one single moment in time. Make the most of it. Shoot from your heart.